Wondering how to implement an influencer marketing campaign? Looking for a plan to follow? In this article, you’ll discover nine steps to plan and execute an influencer marketing campaign. 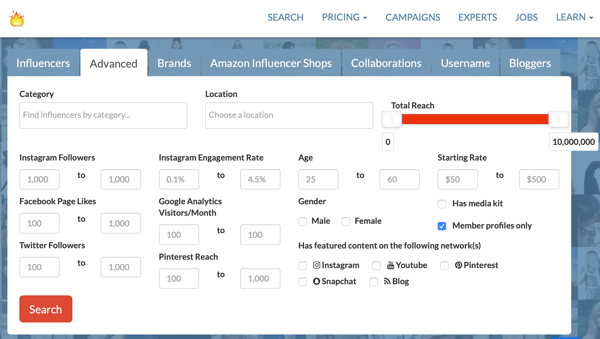 How to Plan a Successful Influencer Marketing Campaign in 9 Steps. Messaging: Outline the key messaging or language you want to use. Also note brand sensitivities (topics/actions you want to stay away from). Key dates: Identify pre-launch dates, launch periods, and noteworthy events (seasons, holidays, or months) that the campaign will revolve around. Budget: Set the budget for your campaign. The budget will dictate what tier of influencer you can partner with, how many influencers you’ll be able to activate for the launch, and creative concept scale. It also helps you determine how much money is available for paid media. Content: Choose what platforms you want to activate on and what type of content you prefer (image, video, stories, carousels, etc.). Also mention FTC guidelines. 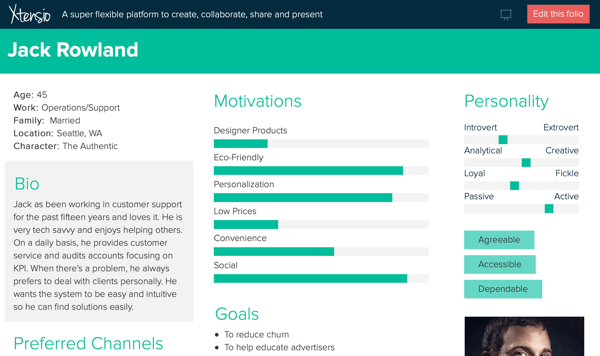 Audience: Creating a buyer persona helps shape what your campaign’s target audience will look like. Because this is an influencer marketing campaign, be as specific as possible. When defining KPIs and goals, keep in mind this is how you’ll measure campaign success. So whether the goal is to increase brand awareness or confirm a specific number of visitors for an in-store grand opening, you’re setting up the first part of your campaign analytics. Tools like Influence.co (shown below) can help you find influencers to partner with. After you put together a list of potential influencers, you’ll need to evaluate them for fit with your campaign. Do you want to work with multiple smaller-scale influencers (nano- or micro-influencers) or go with one tier-1 influencer or traditional celebrity? Does the influencer’s audience demographic align with your target audience? Has the influencer worked with any competing brands? What is the influencer’s previous experience creating and executing branded content? Does the influencer display a particular affinity for your brand (which would enhance the authenticity of the campaign)? After you choose an influencer for your campaign, you’re ready to begin the next phase: content management. Planning your campaign content strategy involves setting expectations and guidelines for the brand, agency, and influencer. This will let the influencer know what’s expected from them and open the door for collaboration. Include specifics such as which platforms the campaign will be activated on, the number and type of posts expected from the influencer, and a timeline for when content should go live. This is also where you should discuss paid media as part of the delivery strategy. Usage and exclusivity are typically handled on a case-by-case basis, but they’re important to consider when crafting your influencer agreement. For usage rights, define who has the rights to creative campaign content once the campaign launches and after it concludes. If you want to retain the right to repost content for the remainder of the calendar year, get the influencer’s agreement and include that in the contract. For exclusivity, you can place a restriction on the influencer from working with a list of competing brands for a specified time period. Successful branded content needs to command the limited attention span of audiences. Whether it’s you or the influencer directing it, all good creative begins with research. This is where your buyer persona is important. When mapping out creative, research audience interests, analyze competitors, and evaluate your existing social media marketing efforts. After you’ve finished your research, brainstorming sessions are essential. 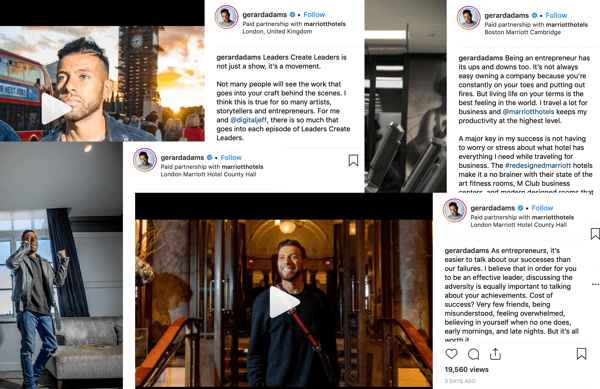 One of the benefits of working with an influencer is leveraging the authenticity and connection they’ve built with their audience. 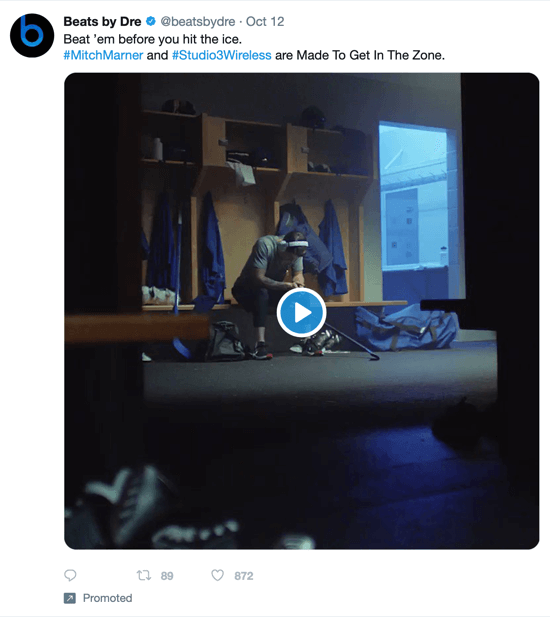 Pushing out creative that appears too salesy is a huge influencer marketing “don’t”. Once you’ve developed an idea, map it out and create an outline to share with collaborators. Ultimately, influencer content should be memorable, helpful, or otherwise make a lasting impact on audiences. 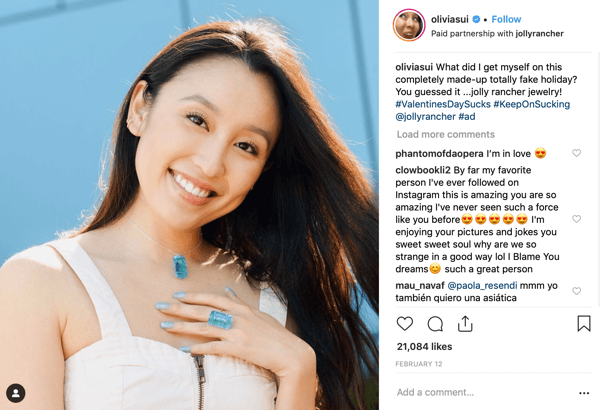 Here, influencer Olivia Sui sported Jolly Ranchers jewelry for the candymaker’s Valentine’s Day campaign. What may seem creative to one person may not to another. Provide influencers with a thoroughly fleshed out brief about your brand before brainstorming creative. Some brands let the influencer create the content they believe will help them achieve campaign goals. Other brands require final creative approval, including several rounds of revisions. Both approaches are fine, as long as communication and feedback are open, honest, and transparent. Keep in mind that flexibility goes a long way. Sometimes if you’re less rigid with guidelines, influencers may enjoy the partnership experience more and organically create content (considered added value!). Once the content is live, check the analytics to gauge how the content is performing and optimize strategies if necessary. If the goal is to reach a certain amount of impressions, consider using paid media to boost visibility. Platforms like Facebook have paid media targeting down to a science. It’s important to review and learn from campaign reporting, which includes overall campaign and individual contributor engagement. Data such as earned media value, organic vs. paid results, sentiment analysis, and top content give you a fuller understanding of campaign performance. Once you’ve measured overall performance with a campaign report, compare the results against the KPIs and goals you initially set for the campaign. Remember, there are two types of engagement data to view: audience and creator data. You need to view the total number of actions/rates (likes, comments, views, unique impressions, overall reach, and engagement rate) of the top-performing content to see what resonates best with your audience. Don’t completely write off low-performing content, however. Look for engagement insights such as the best time to post or even the best platform for engagement. See if you can repurpose low-performing content based on what you’ve learned. Reviewing audience sentiment markers such as comments can reveal useful information. When reviewing creator data, check out individual engagement rates and what pieces of content resonated best with audiences. The three main phases of planning influencer campaigns are brand strategy, content management, and analytics. Following the plan outlined above will help you effectively design your campaigns and get the most out of your partnerships. What do you think? Have you partnered with influencers to promote your products and services? What type of influencers would be the best fit for your business? Please share your thoughts in the comments below.